A while ago one of my readers, Dave, who writes the blog 42N Observations, clued me in about a song by a Japanese artist that topped the U.S. charts in the early 60s. The recent tragic events in Japan reminded me to recheck out the link he sent me and post about the song, called "Sukiyaki" and sung by Kyu Sakamoto. The original title in Japanese was "Ue O Muite Aruko," which translates to "I look up when I walk." However, the British record company that produced it (Pye Records) renamed it "Sukiyaki" after a DJ had trouble pronouncing the original title. In light of the disaster in Japan, listening to the lovely song - which is about sadness and isolation in Japan following WW2 - seems poignant and haunting today. 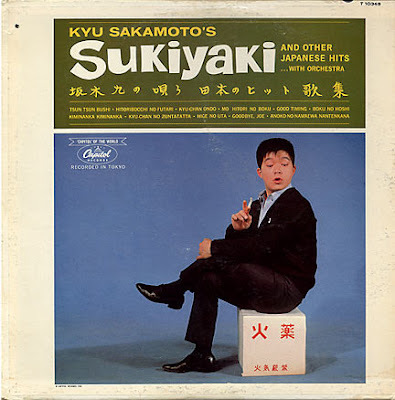 As Dave pointed out to me, it's pretty remarkable that "Sukiyaki" became a number one American hit on the Billboard charts in June 1963 - a time when WW2's generation hadn't quite warmed up yet towards our former enemy countries. 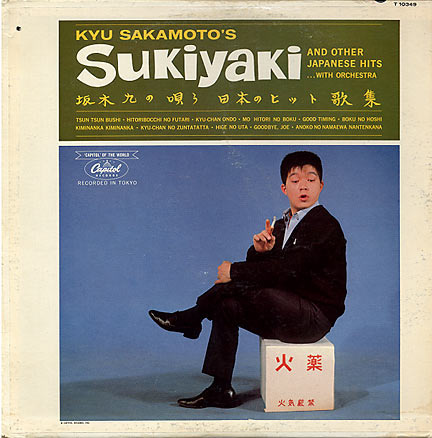 The song's success made Sakamoto a sensation, and he was invited to appear on many American TV shows, including The Ed Sullivan Show (which he had to turn down because he was filming a movie.) He did have a second, but much more minor American hit called "China Nights" in late 1963. Sadly, he died in a 1985 plane crash. I hope you'll give the song a listen. And thanks to Dave, for passing it on to me! Thank you for posting Sukiyaki. It is such a great melodic song. There are a few live performances of the original that can also be found on YouTube. I've heard the song once (on an AM oldies radio station) since I sent the initial information to you. Its still in airplay rotation! I really love this song.It somehow manages to make me smile but sad at the same time. I actually was not familiar with this song at ALL. I don't remember the original, let alone the 80s cover! This song is on steady rotation on the AM radio oldies station, WJJL 1440 here in Buffalo...I love this station! I don't really remember this song. It has been playing in my head off and on for the past couple of days now. I'm glad that you posted it. 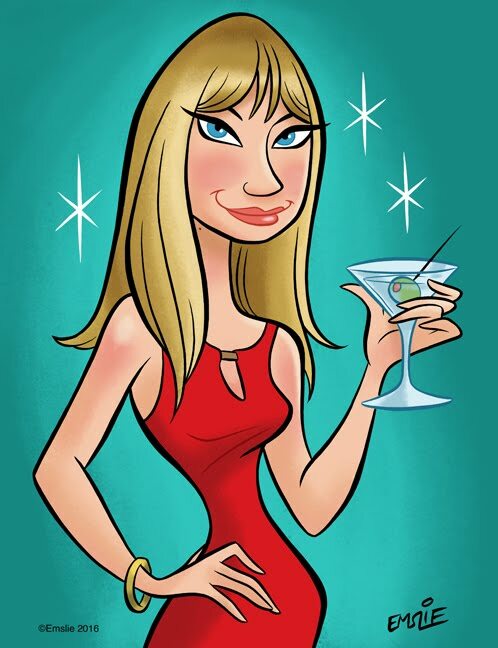 Hope that you are having a good weekend. Go Retro Reaches 200 Followers!